Well, and now I’m back down to earth after spending a fortnight experiencing acute pain (and they’re STILL sore) and then talking pain at the Conference. Not a major post today, just some links from the conference that might be worthwhile looking at. First of all, Prof Mike Chester spoke about angina pain, and has an extensive website on managing refractory angina at this site. Take a look at the resources! Wow! The care pathway is a comprehensive guideline for systematically managing the problem of persistent angina (oh and much of it could also apply to persistent noncardiac chest pain). I especially appreciate the chapters on management that include the patient centred model, something that acknowledges that if a person is given adequate information about their treatment options, they can then make their own decision about what to do next, with a little support. Another speaker was Associate Prof Mike Nicholas, a frequent visitor to New Zealand (well, you know he is really still a kiwi underneath! ), who established the INPUT and ADAPT pain management programmes, and is both an articulate and informed speaker about interdisciplinary pain management. Head to here to read about ADAPT and here to read about INPUT. Something I particularly appreciated about Mike’s comments were that there is a definite dose-response in terms of how much input is needed for an effect to occur when using a cognitive behavioural approach to pain management. Pain management ‘lite’ does not have as much of an impact as intensive pain management. If you’ve never heard Lorimer Moseley speak, you’ve missed a treat. He’s a relaxed Australian who can get a whole roomful of clinicians to stand up and ‘Do The Time Warp Again’! For a video from 2008, take a look at this…and if you do a search through MedLine, you can’t miss his publications – there are quite a few! While much of his work is basic science or related to neuroimagery, his heart is to apply the research to real people with real chronic pain, particularly complex regional pain syndrome. And if you missed out on attending, you can go to the NZ Pain Society website and look through the powerpoints which will be up shortly. I’ll be posting shortly about some of the other things that I enjoyed (apart from the Polynesian Spa…), and post the powerpoints from my presentations too. 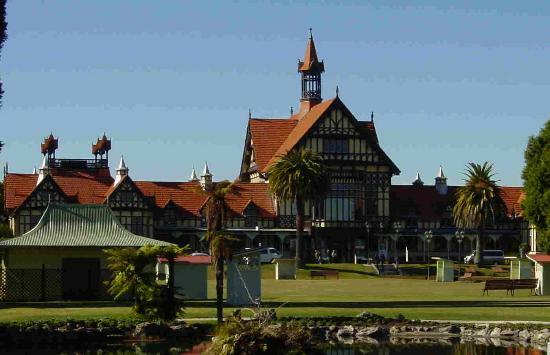 This year’s conference is in Rotorua in July. Take a look at these speakers! There is Professor Michael Chester Director of the National Refractory Angina Centre, Consultant Cardiologist Royal Liverpool and Broadgreen University Hospital NHS Trust. Professor of Rehabilitation and Preventive Health Education, Liverpool Hope University. Lorimer Moseley, knownfor his work on motor imagery in complex regional pain syndrome, Senior Research Fellow, Prince of Wales Medical Research Institute, Randwick, Australia. And Michael Nicholas, Clinical Senior Lecturer, The University of Sydney, Anaesthesia and Pain Management, Department of Anaesthesia. Go here for more details, and the preliminary version of the programme. 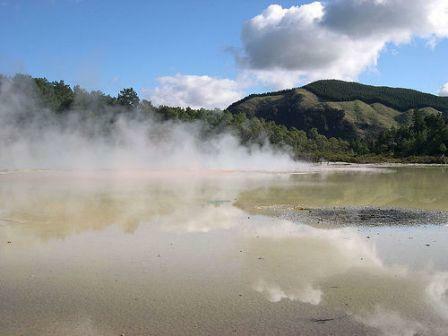 If you’re not from New Zealand – Rotorua has to be seen and experienced! It’s a beautiful location, New Zealand’s largest geothermal region with both excitement and relaxation all within a very small area. And the mud pools are a feature, along with geysers and hot pools. There are some grants available from the NZ Pain Society, but costs of the Conference are pretty reasonable anyway (if you register before 12 June, it’s $545 for non-NZ Pain Society members). Calling occupational therapists working in pain management! Calling all occupational therapists working in the field in New Zealand to register for the pre-conference occupational therapy meeting. Registration will be a tiny $40, and the opportunity to network – priceless!